Me, Drawing, NYC is an animated illustration series related to myself, showcasing various places in the city documenting my experiences of studying abroad. I want to convey how New York City looks through my eyes. 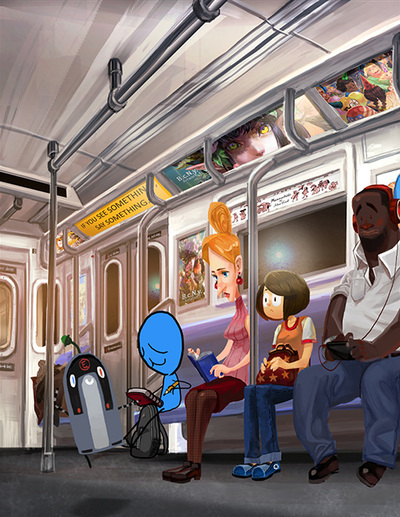 Each illustration is a fixed scene with animated elements. 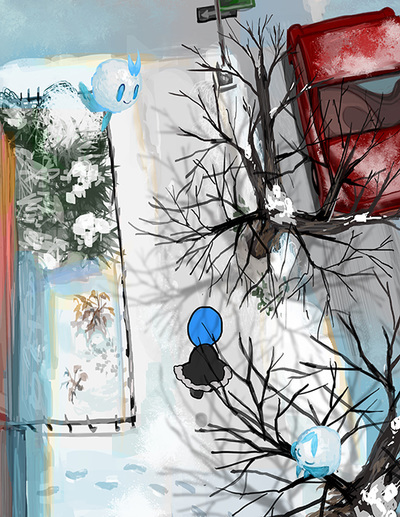 I portrayed myself as a little blue guy who is drawing in a sketchbook in each place, meanwhile expressing my feelings such as curiosity, surprise, isolation or delight. 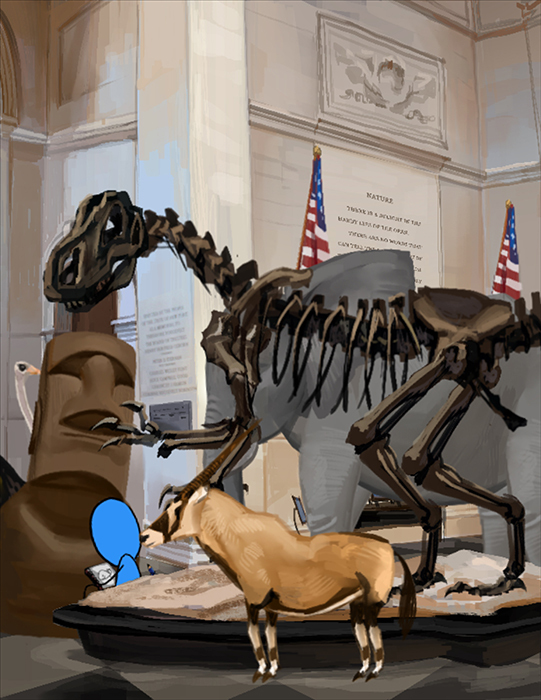 To make the illustration compelling, I designed mascots for each place that appears in the project. The mascots are based on the locations’ features, using strong characteristics and exaggerated actions. 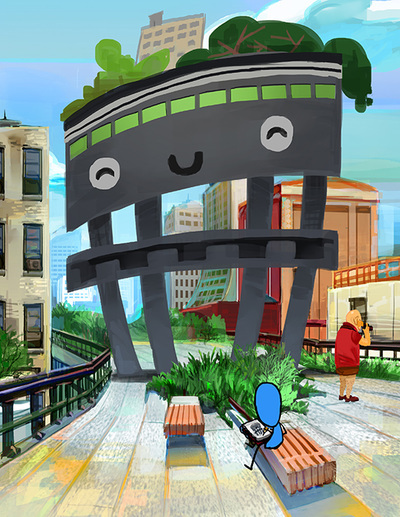 For example, in the illustration about Grand Central, the mascot is a giant four-legged monster whose green skin is based on the color of the ceiling and whose head shape is similar to the design of the window frames. 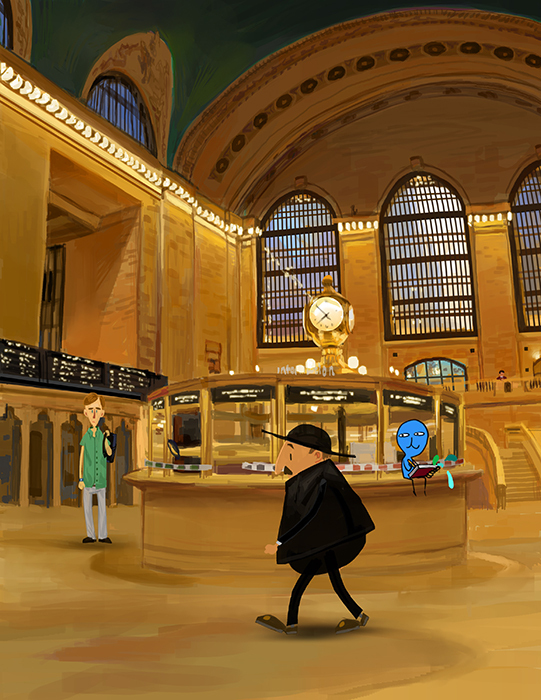 His flying down in Grand Central Station represents the way I feel people are always busily flying through the station. 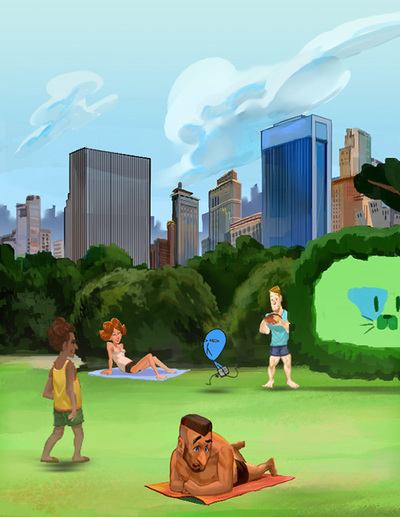 And in the Central Park piece, I couldn’t lie down on the grand lawn like other people, therefore I designed the mascot of Central Park which helped me escape the location. The mood of this project is portrayed with cartoonish, humorous, bright and happy aspects. Also, I sculpted figurines of the mascots and the little blue guy, bringing them to life. It also helped me to observe their dynamic motions better. Furthermore, there is a sketchbook of reportages I did around the city that helped me develop this body of work. Art for me is a language for communicating with the world. My passion for art has allowed me to express diverse ways of communicating through illustration and animation. Me, Drawing, NYC was exhibited in the Museum of Fashion Institute of Technology from June 6 to July 3, 2015. For more information welcome visit the The Exit Lines official Facebook page. Drawing who will have the magazine from an event of my Facebook fan page! ​An animation for revealing the result that who shared a post in my facebook fanpage will have ImagineFX Manga Artist Vol.2 2015. It was my final project in one of my courses in Fashion Institute of Technology in my 5th semester, in which the professor of the course is Celia Bullwinkel. This is an assignment for a course in Fashion Institute of Technology. Trick or Treat! Happy Halloween 2014! Sharing the video with you on this wonderful Halloween.